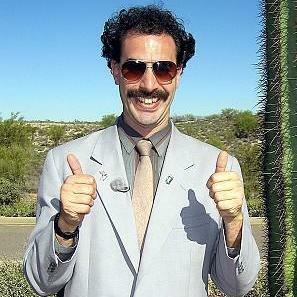 Borat movie make strong statement of bad American culture...NOT! So I haven't written in a while, but I figured it was time to address a subject that has been bugging me for a while...The Borat Movie. I know it has a longer title, but I don't feel like looking it up. I will fully admit that this movie made me laugh quite a bit. In fact, the scene with the chicken and the picture of David Hasselhoff burning still causes Karen and I to crack up when we talk about it. But there were a few things that I didn't get. Since this movie has come out (and I am assuming many of you have seen it as you read this), a lot of folks praised the film for shining a light on how ugly and biggoted our American culture can be. But how about what the Borat movie and it's star, Sacha Cohen, did to attain this oh so lofty and intelligent point of view? Linked above is an article about the people in the village where Cohen filmed the parts that were supposed to be from Borat's home village. In it, the people talk about feeling exploited and hurt. "This is disgusting. They conned us into doing all these things and never told us anything about what was going on. They made us look like primitives, like uncivilised savages. Now they're making millions but have only paid us 15 lei." (which is around $6). I ask you: Where is the liberal outcry? If an evil corporation like Nike or Walmart exploited people like this, you can bet there would be one. If Fox did a movie showing President Bush in a good light while giving impoverished people a sense of hope only to later humiliate them, these same folks would scream bloody murder. Does the end of making America look bad jusitify the means and subsequent deafening silence from the normally vocal left about this? And seriously, as far as Americans being rude, let's look at the dinner scene at the "Southern Plantation." He insulted everyone at the table, but they still tried to be polite to him. He used foul language, and they still tried to be polite. When he left the table, they talked about how even though he had a lot to learn, he seemed very nice and would do well in America. He then returns to the table with A BAG OF CRAP...and one of the ladies shows him how that is not correct way to dispose of waste and how to do it properly. Rude? I know I know...the people who lived on 'Secession Drive' kicked him out when a black person showed up...who I might add was obviously dressed as a prostitute. I think that any educated person at that point would have suspected that Borat might be up to something. I will agree that the frat boys from South Carolina deserved what they got. Did the poor guy who kept his cool while Borat destroyed his shop and did other disgusting things to him deserve that treatment as well? Do you really expect people to not be angry when their national anthem is purposefully butchered? Sure, the movie can be funny, but I'm not sure that it's "brilliant." If exploiting the impoverished and downtrodden, hurting people's feelings, and abusing people's extensions of courtesy to make America look bad makes you brilliant, then maybe it's not such a "great success."